It’s hard to get excited about Lexuses. The brand has a penchant for reliability, comfortable and high-quality cars that need an added dose of adrenaline, which is good for the majority of it’s customers. Occasionally, Lexus creates something special and designates it with a true F Performance badge, not the sportier F-Sport package that’s available on most of it’s cars and SUVs. F Performance started with the Lexus IS-F, which shoehorned a glorious 4.6-liter V8 engine into Lexuses smallest car. Driving the IS-F gave me a completely new perspective on the Lexus brand entirely – it was firm, responsive and the exhaust note at full throttle was a cacophony of musical notes. 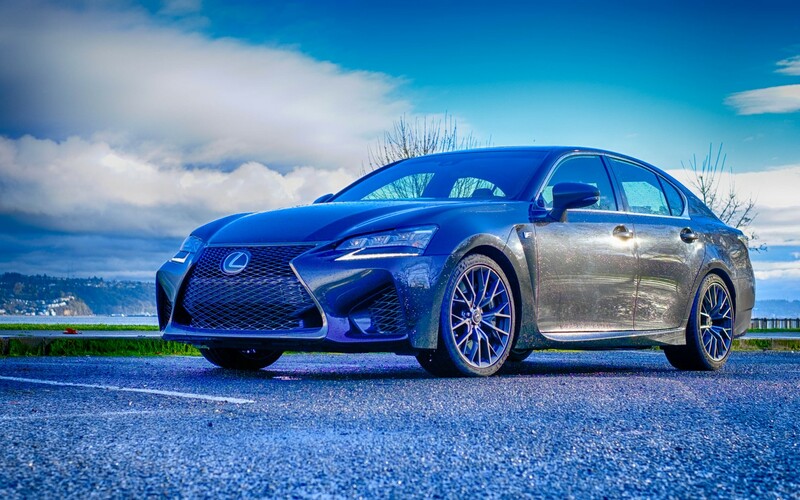 Lexus gave the Audi A6, BMW 5-series and Mercedes-Benz E-Class competing GS the F Performance treatment beginning with MY2016, but does it have the performance chops necessary to tackle long established brands like Audi’s RS, BMW M Performance and Mercedes-Benz AMG? To find out, I spent a week with a 2017 Lexus GS-F equipped with an optional Mark Levinson 17-speaker sound system carrying an MSRP of $86,770. The spindle grille on modern Lexuses evokes love or hate depending on the eyes of the beholder. I personally love the Predator-style schnoz of the GS series and the GS-F just ups the anger factor by reducing the amount of chrome and different grille pattern. LED headlights with LED daytime running lights finished with black housings adorn the front end to give it more aggression. A real carbon fiber rear spoiler and quad exhaust pipes finishes the back end to give a hint of the GS-F’s performance aspirations. The 2017 Lexus GS-F styling is all about subtlety. It doesn’t stand out as much as the BMW M5 or the Mercedes-Benz E63 AMG in the styling department, but it lets the driver keep a low key on the road. 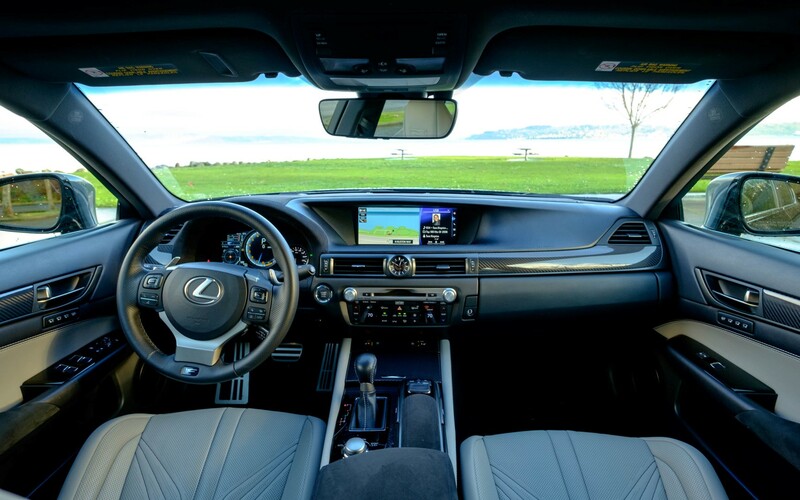 Step inside and the GS-F shares its interior with the mundane GS350 and GS460h, but swaps wood for carbon fiber trim and swaths of alcantara. The race-inspired powered front seats are absolutely wonderful in the GS-F. It provides plenty of side bolster support with adjustable lumbar, but aren’t as annoying to get in and out of as Recarro’s. The seats are heated and ventilated for more comfort, supposedly. I found the seat heaters only luke-warm at best and don’t deliver the toasty-bum feeling I desire in the winter months with freezing temperatures. 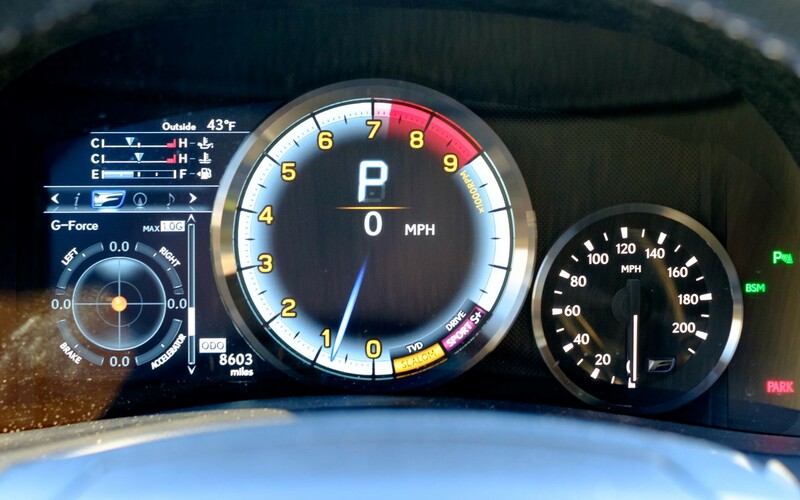 Look forward to see the GS-F’s fantastic dynamic gauge cluster. The analog-style tachometer with digital speedometer is customizable with two different color schemes and employs a trim ring to add visual depth, which looks better than a plain flat LCD screen some automakers are using. The driver information read out on the left of the gauge cluster provides your typical vehicle information like turn-by-turn navigation, driver assists, music information, oil temperature, tire pressure, etc… Exclusive to the GS-F are performance displays that show your G-Forces, lap times and torque distribution. 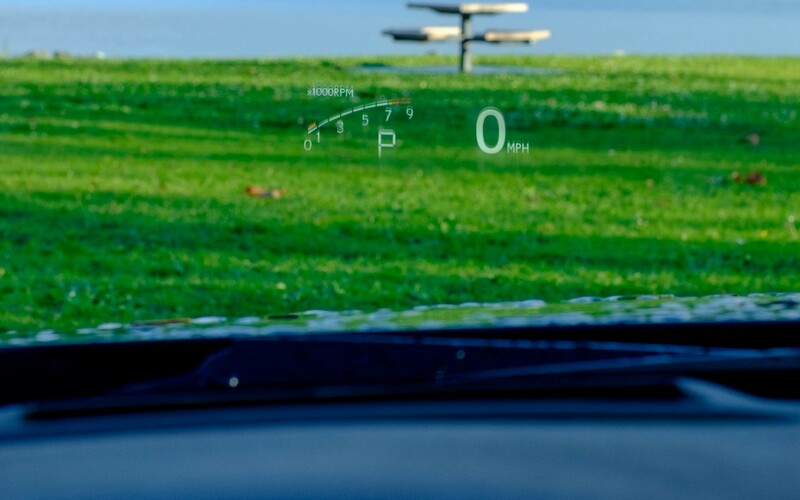 A head-up display (HUD) is available on the GS-F to display your speed, turn-by-turn navigation, speed limits, gear shift and tachometer. While the HUD is a nice feature in any car, the Lexus GS-F HUD serves as a dumb secondary display, unlike BMW’s HUD, which has it’s own user interface with a control dial. There are no differences in the infotainment system on the 2017 Lexus GS-F – it’s the standard 12.3-inch found in the regular GS and shared with the LS, RC, RX and LX. That’s not a bad thing, however. The large display is easy to read with quick glances. Lexus employs it’s Remote Touch mouse-style control, which is placed to the right of the shifter. The Remote Touch has haptic feedback to aid moving around the user interface. It’s a bit odd to use at first, but if you use a mouse on your computer regularly, it’s quite easy to become acclimated. Functionality is standard fare on the Lexus Enform system. There’s navigation, SiriusXM HD Radio, CD player and USB media playback compatibility. A companion app installed on iOS and Android phones provides access to Pandora, Slacker, I Heart Radio and other online services as well. The Lexus Enform system is pretty intuitive, but Android Auto and Apple CarPlay support would make it even better and futureproof. 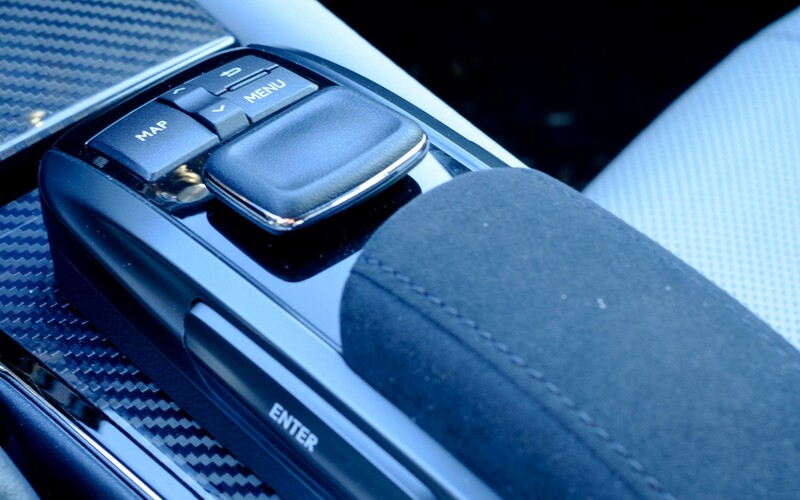 Audi, BMW, Mercedes-Benz and even Genesis support the advanced smartphone connectivity standard while Lexus is holding out, unfortunately. Powering the 2017 Lexus GS-F is a 5.0-liter V8 pumping out 467 hp with 389 lb-ft of torque that redlines at 7,300 rpm. The harmonically-gifted engine is mated to an eight-speed automatic transmission with paddle shifters to propel it’s 4,218 lbs of mass to 60 mph in 4.4-seconds and through the quarter-mile in 12.9-seconds. It’s down on power compared to the BMW M5, Mercedes-Benz E63 AMG and Cadillac CTS-V, but the Lexus GS-F has a unique character to it. The sounds the engine makes is auralgasmic – it’s a subtle grumble when you’re driving gently, but lay on the lead foot and it opens up to an angry growl that sends enjoyable chills down your spine. 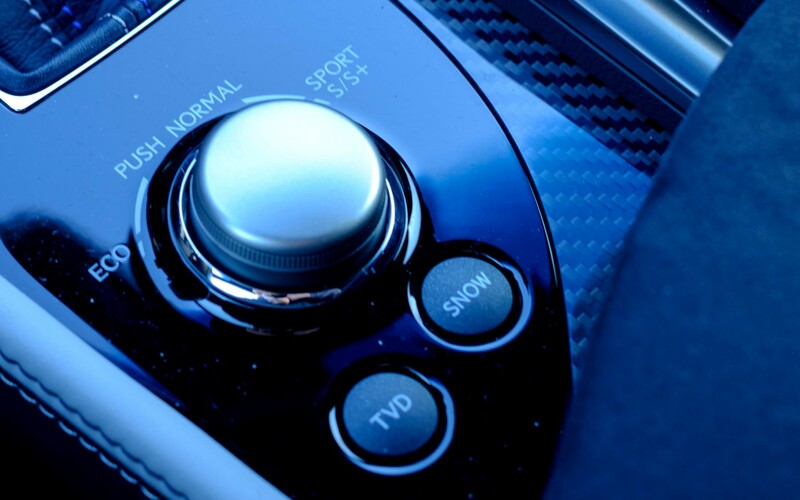 A drive mode selector dial lets you choose which driving style suits you – Eco, Normal, Sport and Sport+. The different modes alter steering and throttle response of the car. I’m not sure why you’d ever buy a sport sedan only to drive it in Eco mode, but the option is there. The torque-vectoring differential (TVD) lets the you change the driving characteristics of the car by altering how torque is distributed between the rear wheels. Standard, slalom and track modes are available to keep the car suitable for daily driving, aggressive enjoyment along twisty roads or track use. Driving the 2017 Lexus GS-F is a treat – it’s well planted through windy roads without sacrificing comfort. The suspension feels firm but the dampers keep the overall ride supple. It’s a much easier car to live with than the previous Lexus IS-F, which sacrificed suppleness for aggressive handling dynamics. I did find the eight-speed automatic transmission to show noticeable lag before it would downshift when you floor the gas pedal. It’s a minor annoyance, but the GS-F transmission doesn’t respond as well as the IS-F.
Lexus equips the GS-F with standard driver assists, like adaptive cruise control (ACC), blind-spot monitor (BSM), pre-collision braking and lane keep assist (LKAS). ACC in the GS-F is extremely disappointing as the system remains unchanged since the car debuted for MY2013, which means it requires driver intervention if traffic falls below 19 mph. It’s German, Japanese and even Korean rivals have full speed ACC systems that can stop the car completely and hold it in stop and go traffic. Lexuses LKAS system does a decent job of keeping the GS-F within the lane markers, as long as you’re driving above 32 mph. It’s the farthest thing from an autonomous car, but the 2017 Lexus GS-F isn’t something you want to let the computer drive itself. 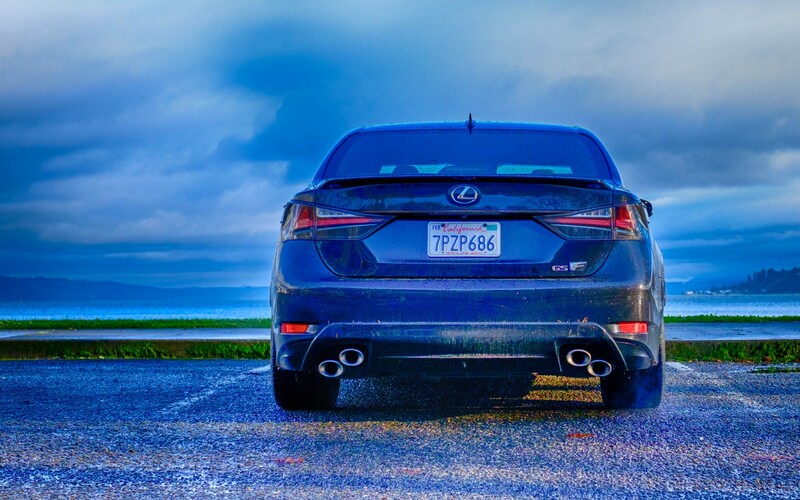 I shut off the LKAS to truly enjoy driving the GS-F the way it’s meant to be driven – hard with a lead foot. It’s easy to write off Lexus as a automaker that creates boring-to-drive vehicles for the AARP crowd. Luckily, the 2017 Lexus GS-F is far from that and shows when it’s engineers put their collective minds together, they create a sport sedan that’s worthy of your attention. Ultimately, the 2017 Lexus GS-F is about achieving the perfect balance of driving emotion while keeping the car livable as a daily. 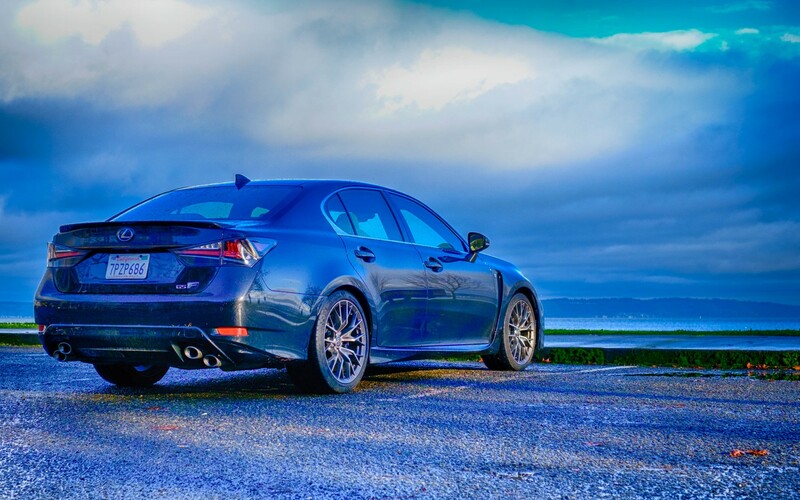 The Lexus GS-F embodies the right ratio for a fun and comfortable daily driver. It’s not as raw or powerful as its German competitors and falls behind Genesis in the technology department, but the Lexus GS-F is a car that delivers plenty of smiles per gallon with a soundtrack that’s to die for. Tuan Huynh is a tech and automotive enthusiast that wrote his first hardware review at the age of 14. Since then, he's written for publications like, TechRadar, Tom's Guide and Tom's Hardware, covering PC and automotive subjects. He also served in PR and marketing roles at ASUS Computers and PC components manufacture ZOTAC. Is this the most advanced Toyota yet?